When Cardinal Ratzinger became Pope in 2005, we who keep watch of Church affairs all knew there were possibly going to be many changes or at least a clean up of the Liturgy. We were right! Pope Benedict XVI had many inquires started in order to investigate the abuses carried out on the Liturgy after Vatican II documents were misinterpreted. After all, being in charge of the Congregation for the Doctrine of the Faith, he knew all the details better than anyone else. He knew what was going on, who was doing it and how to tackle the problems. Let's not forget that he was also part of Vatican II as a young priest. Basically what Pope Emeritus is saying here is that the sign of peace has been distorted. Like he wrote, it is "exaggerated and cause a certain distraction in the assembly just before communion." He is correct! The sign of peace has been abused for many decades now. Many times, people are running around the church hugging and kissing one another and are not even paying attention to the "Lamb of God" or the breaking of the bread. It just looks awful. It takes away from the seriousness and solemnity of having the Holy Eucharist present. He also offered the suggestion of moving it which I will address later on. The priest even at times steps down to the pews to shake people's hands. Sometimes he is still shaking people's hands as the choir sings the "Lamb of God." It's just irreverent and turns the Mass into a social gathering instead of a commemoration of the life, death and resurrection of Jesus Christ. It sometimes feels as if people are greeting each other because the world is about to end and they have to exaggerate the greeting. 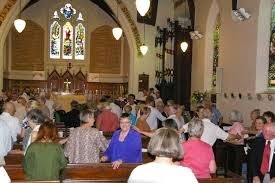 After Mass, people can say hi to each other all they want. There's no need to exaggerate during this part of the Mass as if you're never going to see each other again! As stated above, the priest coming down to greet people seems fine, but sometimes it's just a disaster. It takes time and he is contaminating his hands after he washed them during the offertory. It's just sad to see the Holy Eucharist alone on the altar as the priest is out and about "high fiving" people as if this were a concert. Let me not get into children's Masses where a priest goes around petting the head of kids which almost looks like he's playing "duck-duck-goose." The focus becomes the priest, not Jesus on the altar who we are about to receive. The priest coming down from the altar to shake hands and "high five" everyone contaminates his hands. He then breaks the host and prepares ciboriums for Holy Communion with those hands which have become petri dishes. This is a recipe for the "flu/cold, hepatitis apocalypse." I've already established how the priest coming down to greet everyone is distracting, but there is also the congregation itself. Having people move from pew to pew, or around the church to greet a friend who is shy and sits 100 feet away is just not necessary. The noise this movement makes, and as I mentioned before, the lack of attention given during the Lamb of God just makes the Mass look like it stopped for a brief movement to become a social gathering. It sort of reminds me of that viral video "Harlem Shake" where the video shows people behaving normally and then all of a sudden music comes on and they start dancing or doing crazy things only to then return to normal as if nothing happened when the music stops. This is what the sign of peace sometimes looks like. The Mass starts out solemn and going steady and then out of nowhere, it turns into this social gathering with people running around and then it calms as if nothing happened. Now I'm a young guy who likes to party and have fun, but there's a time a place for that. I think Ecclesiastes 3:8 would agree with me. The Mass is NOT the time nor place! Anyhow, the Congregation for Divine Worship which conducted the 9 year long study decided not to remove the sign of peace. There were rumors that it might be moved to before the offertory as a symbol of one having to be right with his brother before coming to the altar. Matthew 5:23-24: "If you bring your gift to the altar, and there recall that your brother has anything against you, leave your gift there at the altar, go first and be reconciled with your brother, and then come and offer your gift." This sounds like a good idea, but this change is too abrupt to do now. However, the congregation did give recommendations. It said that it will present some "practical measures to better express the meaning of the sign of peace and to moderate excesses, which create confusion in the liturgical assembly just prior to Communion." The congregation reminded us that the rite is optional. Many don't know this, but the priest or celebrant doesn't have to tell the people to exchange a sign of peace with one another. Masses on EWTN celebrated by the Franciscan Friars of the Eternal Word often do this. Another recommendation the Congregation for Divine Worship gave was to update the way the Roman Missal directs celebrants on the sign of peace offering more suitable ways that do not distract from the Mass. Lastly, it also made it clear that several abuses had to end. Among these are the "song of peace" which is typical of Spanish Masses where they sing some song that is not even liturgical as well as the movement of the people and priest in order to greet one another. It also condemned the use of the sign of peace at funerals or weddings as platforms to congratulate others or offer sympathy on the loss of a family member whose funeral is being offered. Nevertheless,the Congregation for Divine Worship made it clear its wishes that bishop's conferences around the world offer catechesis or education forums in order to instruct celebrants and the lay faithful on how to correctly observe the sign of peace. I agree with the Congregation for Divine Worship that the sign of peace has become a social show within the Mass. It can be distracting and rude towards our Lord in the Blessed Sacrament. However, there will be some people who will not be happy with this study and its recommendations. Those who call themselves "conservative" Catholics are ecstatic about this, but there are those who may not consider themselves "liberal" Catholics who will be upset for cultural reasons. Hispanics, Italians and other groups love to hug, kiss and be friendly. The Congregation for Divine Worship needs to address the issue of inculturation in regards to the sign of peace. People already think the Mass is too "Eurocentric" and cold and prefer to attend a Protestant service which makes them feel "at home" many times. Bishops will need to tackle this problem where those who are used to more social-bodily forms of greeting will feel left out or awkward in an ambiance that may look more like a lineup of frozen soldiers than brothers and sisters in Christ.